JeevesBond posted this at 08:24 — 20th September 2008. This might be of interest to people running Ubuntu desktops. There is an interesting new tool for managing Apache in Ubuntu, it's already in the repositories for the next release (in October 2008). However, a version for Ubuntu 8.04 LTS is available. Apparently they're also working on remote management for Ubuntu and Debian servers. The bad news is: this won't work on Fedora/CentOS/RedHat as it's deeply ingrained in TheDebianWay(tm). 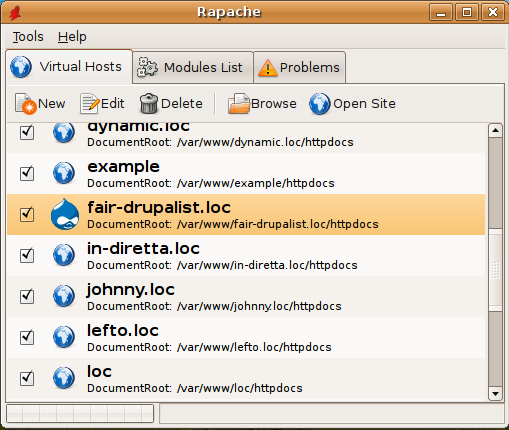 Then click Applications -> System tools -> rapache, in Ubuntu, to start the application. teammatt3 posted this at 23:16 — 20th September 2008. I don't see a huge use for this yet. I think most web servers don't have a desktop installed (or run Ubuntu). But if that remote administration thing gets finished it would be awesome (it would behave more like MySQL GUI tools, at least I hope). The automatic backup tool is sweet and so is the syntax highlighting (I think vim does a pretty good job too though). Thanks for the link Jeeves. I followed your instructions and it worked like a charm. katty45 posted this at 06:04 — 3rd December 2012.
oh it is good if it is with ubuntu. zeek posted this at 19:05 — 17th May 2012. JeevesBond posted this at 20:08 — 5th June 2012. Sadly, it seems Rapache is no longer being developed. The last update was in 2009. Shame, it looked really promising. GMTGuy posted this at 23:06 — 10th September 2012.